There is probably no more iconic Civil War image than that of the young Confederate soldier, heading off to war with an absurdly large fighting knife in his hand or on his belt. Early war southern ambrotypes and tintypes provide us a with a dizzying array of large, wicked, and sometimes comical fighting knives of all descriptions, usually made by local blacksmiths for the southern boys of 1861 to take to war. Over the years, the majority of these local knife makers have remained anonymous, although sometimes certain traits and characteristics of surviving knives can help us to make general statements about the likely region or state that an unmarked knife may have originated in. More recent scholarship has allowed us to identify some knives as to their maker, even though they bear no markings. 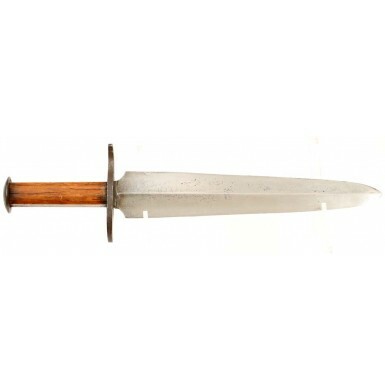 The classic southern fighting knife was usually overly large and robust, with an overall length that was typically between 12” and 24” and with blades that varied from about 8” to over 18”! This knife is one of those rarely encountered examples of a locally made, and unmarked Confederate fighting knives whose maker and history has been identified. This knife is the work of Benjamin Wilhoite of Madison County, Virginia. According to the research on Wilhoite published in The Confederate Knives of Madison County by Harold Woodward Jr., and used in Confederate Bowie Knives by Josh Phillips, John Sexton & Jack Melton, Wilhoite established his blacksmith shop in Wolftown, Virginia, a village located about half way between the county seats of Madison and Greene. Wolftown is located about 30 miles east of Harrisonburg, VA and about 30 miles north of Charlottesville, VA, just on the other side of the Blue Ridge Mountains from Harrisonburg. According to Woodward, Wilhoite’s blacksmith shop included three forges, and was 40”x28”. Woodward further notes that three slaves assisted Wilhoite in his labors, but no slaves are listed as being owned by Wilhoite in the 1860 Census. According to the 1860 Census Wilhoite (spelled Wilhoit in the census records) is listed as a blacksmith, 48 years old with an estimated birth year of 1812. Wilhoit(e) was listed as having real estate valued at $4,000 and a total personal estate valued at $5,000. The census lists the other household members as his wife, Eunice (45) and four children: Benjamin W (male, 15), David S (male, 14), Jeme Mc (male, 11) and Betty K (female, 7). Further investigation into the Confederate Citizen Files (National Archives Record Group 109 / M346) reveals that with the coming of the Civil War, Wilhoite did business with the Confederate government, but as a blacksmith supplying horse shoes, nails and shoeing services, or as a source for supplies and fodder such as wood and hay. No mention in the 20 or so pages of records includes knives. However, wonderful research by Woodward and others who have family knives made by Wilhoite and passed down since the Civil War have allowed us to identify his work and for some of the units he made knives for. It appears that Wilhoite made the knives on a contract basis for the men going off to war, selling them individually and not to the state or Confederate government. Research indicates that men who served in five different locally organized units carried knives made by Benjamin Wilhoite. These units include the Greene Rough & Readies (Captain St. Clair Deane’s Artillery Company, later 34th VA Infantry), the Jeff Davis Guards (10th VA Infantry), the Madison Invincibles (Company C, 4th VA Infantry), Company F of the 13th VA Infantry and the Madison Home Guards. Three basic patterns of Wilhoite knives are known, categorized as Types I, II and III by Phillips, et al. The Type I knife was the basic enlisted man’s knife and two identified examples exist, both identified to Greene county Confederate soldiers. 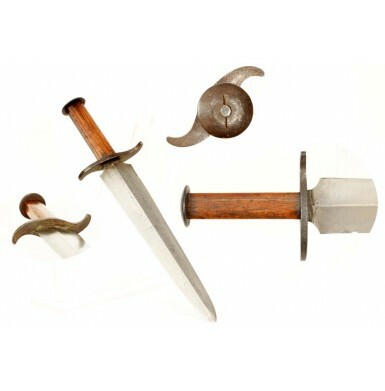 Three of the Type II or “Officer’s Knives’ exist that are identified to officers who served with some of the above listed units. Finally a single example of a Type III knife is know, which is substantially different from the other knives, and was given to William Simms of Company F, 13th VA Infantry. It is believed that Simms, a tinsmith, made the scabbards for Wilhoite’s knives and received this special double D-guard knife as a token of appreciation for his work for Wilhoite. The Type I and Type II knives are fairly similar in overall design, with the Type II knives being somewhat more embellished for the officers who purchased them. In general they have extremely well made spear point blades of a quality that suggests Wilhoite was a skilled cutler in addition to being a blacksmith. The consistent quality in the blades overshadows the typical work of a blacksmith who was not well versed in blade making. The blades are all slightly hollow ground and tend to be slightly over 2” wide at the widest point, with a well-defined median ridge down the middle of the blade. The blades are fairly thick as well, normally around .40” at the ricasso and around .30” along the median ridge above the ricasso. The blade lengths vary to some degree, with the published examples of enlisted (Type I) knives varying form 11” to 13 ““ and the officer” (Type II) knives varying between 11 3/8” and 12 1/8”. The massive 18” blade of the single Type III knife owned by Simms is probably an exception to the way Wilhoite constructed fighting knives and is certainly atypical. The guards are of iron and S-shaped. The hilts are typically of hickory and on the enlisted knives are secured with an iron, washer-style, pommel cap that is threaded on to the tang. 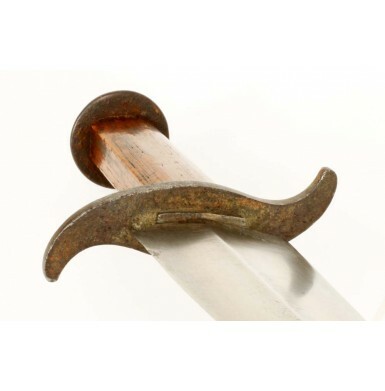 The hilt of the enlisted knife is essentially octagonal in cross section, with left and right sides being wider than the other facets of the grip. The hilt of the officers’ knife is slightly S-shaped, with two checkered scales pinned to the tang. As previously mentioned, the scabbards were of tin, with the officers’ scabbards being covered in leather as well. It is generally believed that General George Armstrong Custer was directly responsible for putting Wilhoite out of business, as a troop of cavalry under Custer’s command burned Wilhoite’s shop on February 29, 1864, while raiding up and down the Shenandoah Valley, and near by areas. As noted above, no receipts for knives are found in the Confederate Citizen Files, only for general blacksmithing and supplies. I would argue that in addition to the knives being private purchase items, they were very early war products, and Wilhoite no doubt turned his attention to much more mundane manufacturing and blacksmithing activities once the initial war fervor was over, and the reality of surviving (and providing for a family) in a region that would be a war zone for the next four years set in. 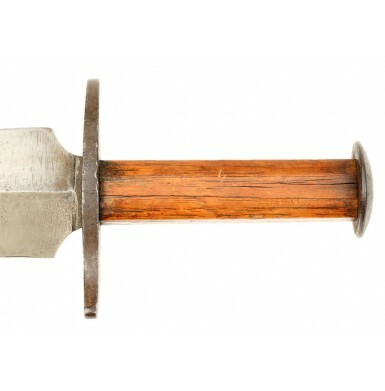 This example of the Madison County, Virginia Enlisted (Type I) Fighting Knife is in about FINE overall condition and is a wonderful example of a scarce, well documented, and known maker Confederate knife. This knife is pictured on page 202 (bottom example) of Confederate Bowie Knives by Melton, Phillips and Sexton. As noted in the general description of Wilhoite’s work, it is far superior to most of the blacksmith made knives that were produced in the southern Confederacy in 1861 and 1862. The knife is 15 ““ in overall length, with a heavy 11” long, hollow ground, spear point blade with a substantial median reinforcement ridge that runs the length the blade. The ridge makes the center of the blade rather thick, measuring about .39” at the ricasso and .296” further up the blade. The blade measures 1 1/8” wide at the ricasso and 2 1/8” wide at the widest point, just above the ricasso. It is interesting to note that three of the four Type I knives listed in the book by Phillips, et al have blades that measure between 11” and 11 5/8”. This suggests that about 11 ““ +/- was the preferred length for a Wilhoite blade, with the one enlisted knife that has a 13 ““ blade being an aberration. The blade length is just long enough to be fairly wicked looking and impressive, but not so large as to be unwieldy and cumbersome. The knife is a comfortable 1 pound, 2 ounces in weight and is much more practical than the many larger southern made knives of the era that often weighed in at two to three times this weight. The iron, S-shaped cross guard is about 4” tall and is securely attached to the tang and grip. The slightly faceted octagonal hickory grip is of a single piece of wood with the tang passing through its center and has the trademark Wilhoite iron washer-style pommel cap threaded on to the end, compressing the grip and securing it tightly to the tang. The knife blade has been lightly cleaned and has a medium pewter patina. The blade shows scattered patches of light pitting along its length, as well as a handful of very tiny nicks along its edges. There is some dark, oxidized discoloration in the pits that are present on the blade. 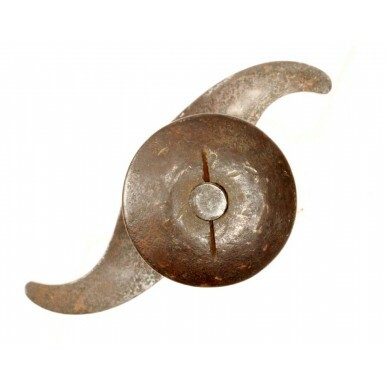 There is also scattered roughness on the iron surfaces of the guard and pommel cap from surface oxidation and age. The hickory grip remains in very nice condition. It is solid, but shows some minor drying cracks that run with the grain of the wood, all of which appear solid and stable, and appear to be the result of shrinkage. The wood grip remains solidly attached to the blade and tang, with no looseness. The grip does show the expected bumps, dings and mars from carry and use, but no abuse what so ever. Overall this is simply a wonderful, completely correct and authentic known maker Confederate Fighting Knife. The knife is in very nice condition, and has great eye appeal. Rarely can an unmarked, locally made, Confederate “blacksmith” fighting knife be identified and so well documented. The fact that Wilhoite’s knives have been so well researched and have a seven-page section dedicated to them in the Phillips book underscores their importance. 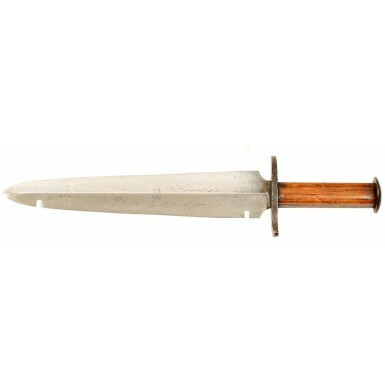 This very knife is photographed and described on the lower half of page 202 of the book. 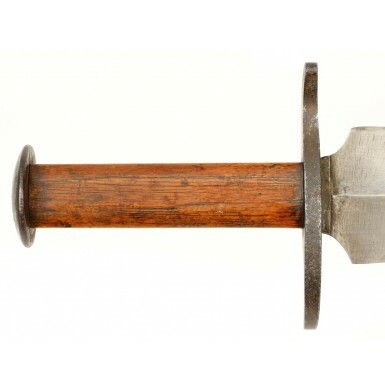 Every collection of Civil War era arms needs at least one Confederate fighting knife in it, and there is nothing better to fill this void than a well documented, known maker knife that has been published in the best current text on the subject. This is a great looking knife that displays wonderfully and will certainly be a great centerpiece to any advanced Civil War or 19th century knife collection or display.